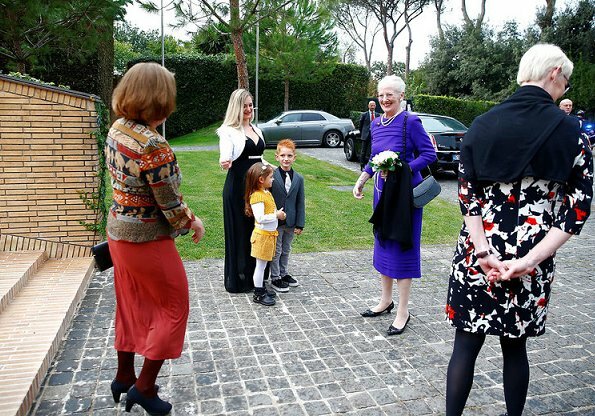 Queen Margrethe is currently making a 4 days official visit to Rome. 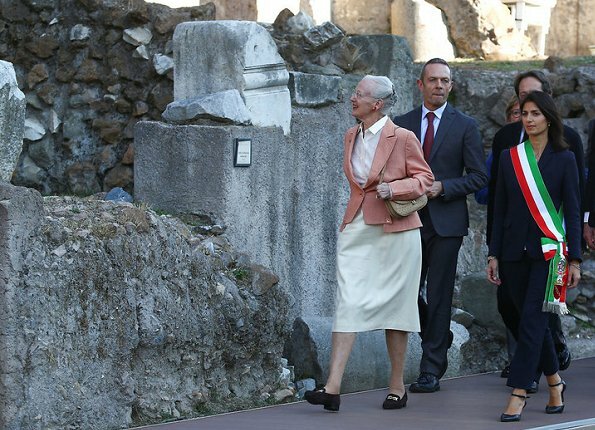 On the first day of the visit, Queen Margrethe visited Cesare Forum in Rome.The Mayor of Rome, Virginia Raggi, welcomed Queen Margrethe II in the archaeological area of the Caesar Forum, where, as a result of the convention between the Capitoline Superintendence and the Academy of Denmark, a new archaeological excavation will be carried out. 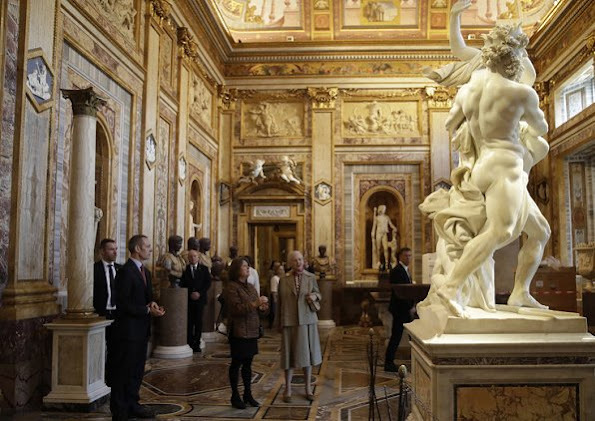 On the second day of the visit to Rome, Queen Margrethe visited Borghese Art Gallery at Villa Borghese Gardens in Rome. The Galleria Borghese houses a substantial part of the Borghese collection of paintings, sculpture and antiquities, begun by Cardinal Scipione Borghese, the nephew of Pope Paul V.
On October 27, 2017, Queen Margrethe II of Denmark met with Italian President Sergio Mattarella at the Presidential Palace Palazzo Quirinale in Rome. 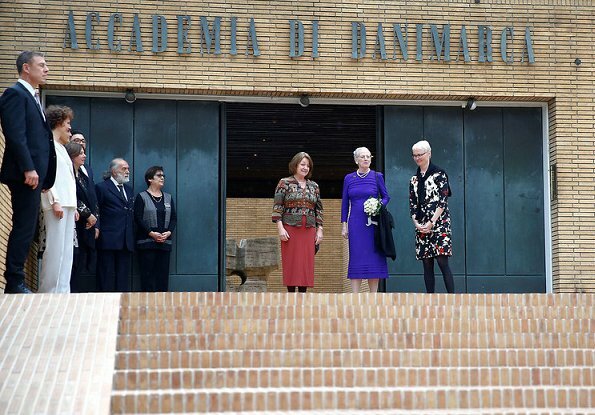 On the same day, Queen Margrethe II of Denmark visited the Danish Institute in Rome and attended the 50th Anniversary celebration held at the Danish Institute. Queen Daisy cleans up nice on this visit. Much better than her usual kitschy fare at home. I am curious as to why you call her Queen Daisy. 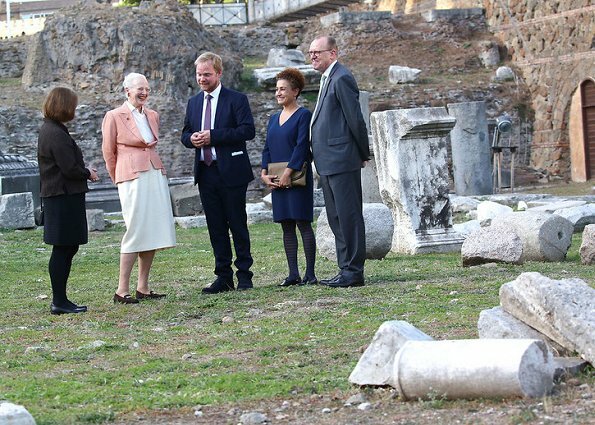 Margrethe is Marguerite, which is a woman's name and the French name name for flower, a daisy. And her nickname at family circles is really Daisy. She has by the way nice collection of daisy jewels. 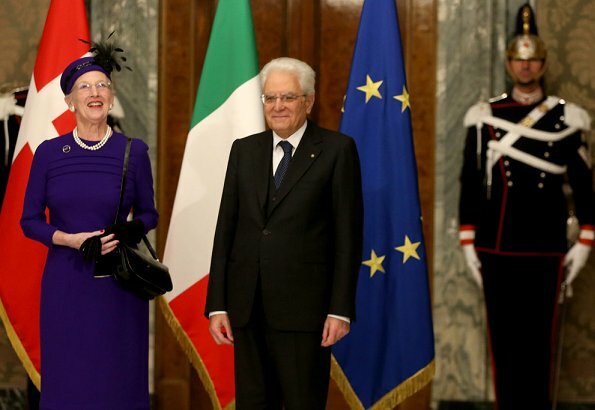 The Queen looks stunning in the outfits. 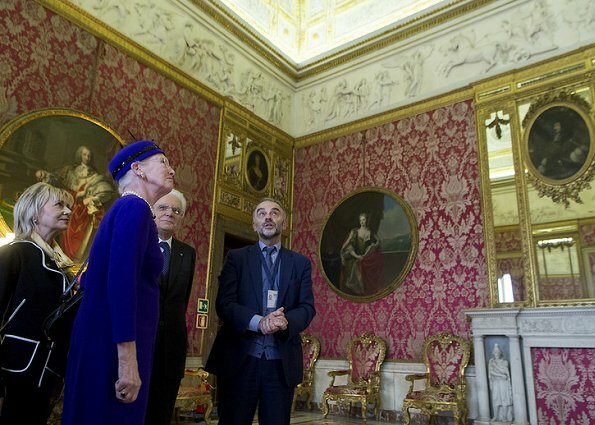 Coral red and off-white suits the queen, it matches the color of her teeth ;-)) A modern hairstyle would suit even a woman of her age though. And for the shoes, I understand that at a certain age you want to wear comfy shoes, but there would be more flattering ones like this. She is age or a couple of years younger. I recently attended the wedding of my granddaughter and was cursing because I could not find nice, dressy shoes to go with my dress. It's all high, very high, spike, stiletto, whatever you name it shoes, that I at 81 could certainly not walk in, or flats, and I mean FLATS! She is my age or a couple of years younger. I recently attended the wedding of my granddaughter and was cursing because I could not find nice, dressy shoes to go with my dress. It's all high, very high, spike, stiletto, whatever you name it shoes, that I at 81 could certainly not walk in, or flats, and I mean FLATS! This Queen has the best accessories any woman can - a big smile and joie de vivre. I rather like her sensible shoes, even if they aren't always tres chic. To me, she is both groomed and comfortable in her own skin. 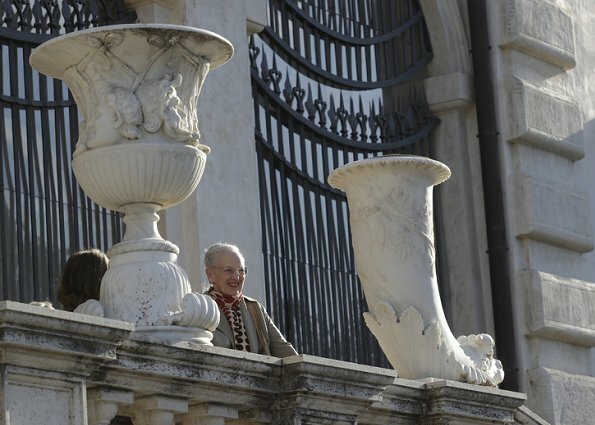 I just love Margrethe. 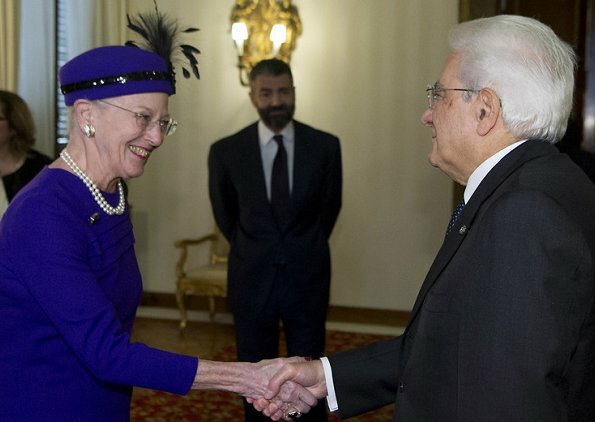 A rude comment about the Queen's teeth. She already had an operation on her spine and therefore the shoes. 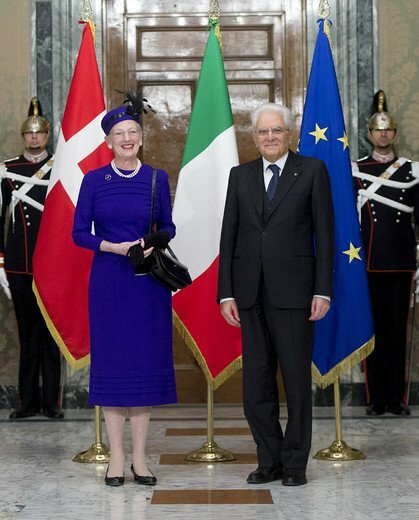 What a nice and smiling Lady! She looks wonderful in blue. 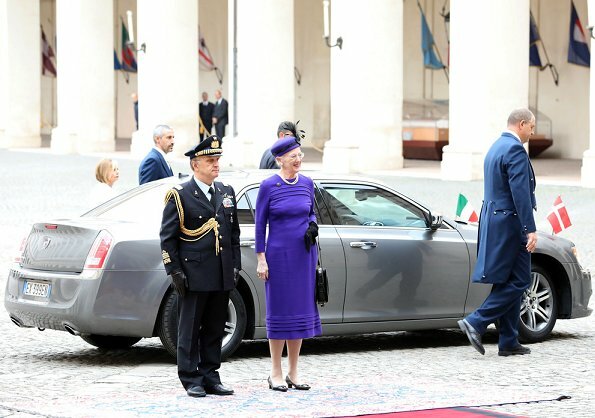 It is odd to make comments about the Queen's teeth and what's wrong with the shoes? 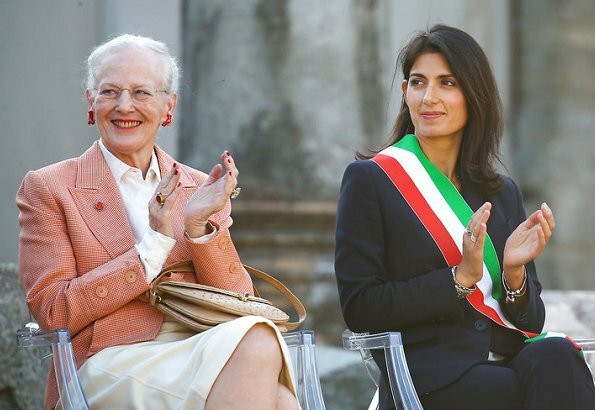 Queen Margrethe is an intelligent, sophisticated and creative woman - she's 77 years old and she isn't a model or one of these ridiculous celebs. And It's a pretty hard job to represent the country always with a smile and open attitude, although you may have other problems.